Kate Ivens prevailed over a tough opponent who hit the ball hard and consistently. Kate was down in the second set but found a way to fight back and finish strong to win her match. Sophie Ivens and Bella Saunders won their matches easily with great serving and deep groundstrokes. Shorewood won all of the doubles matches, so the teams were tied at 3-3 and thus the last singles match to go on would determine what team was going to win. Anna Burke had a lot pressure on her knowing that it was up to her to determine the winner of the match. She started off slow and lost the first set 4-6. In the second set, she started to find her rhythm and was able to relax and hit high quality shots at critical times to take the second set 6-2. The match was a marathon and luckily Anna continued her momentum into the 3rd set and was able to secure a victory for the team with a 3rd set score of 6-1. Shorecrest is 2-0 in league play and 5-2 overall. 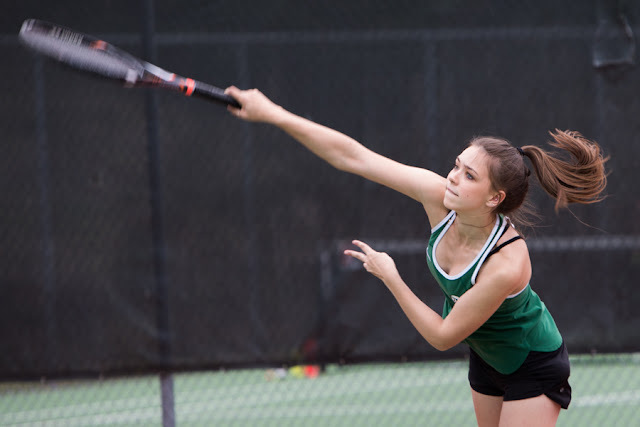 The next match is at Edmonds-Woodway on April 9th at 3:15pm.